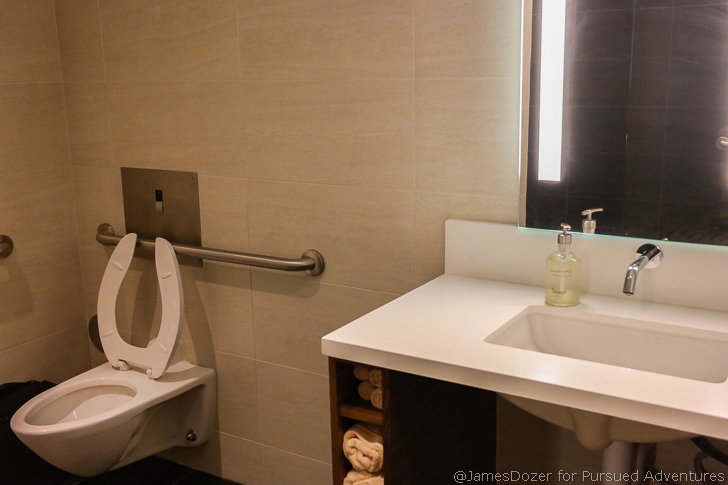 The Star Alliance Lounge LAX is my favorite business class lounge in the entire Star Alliance network. The lounge is a massive space with a beautiful indoor balcony, stunning outdoor terrace, excellent food options and plenty of useable spaces to rest, relax and be productive before your flight. The Star Alliance Lounge LAX is located airside in the Villaraigosa Pavilion of the Tom Bradley International Terminal. Once you pass through the security check point, make a right hand turn and take the elevators up to the sixth floor. The lounge is accessible by premium cabin passengers traveling on any Star Alliance partner flight and Star Alliance Gold members traveling in any class of service. International first class passengers may access the Star Alliance First Class Lounge LAX located within the main lounge. For first class passengers, there is a separate entrance and lounge located to the right of the main entrance. The First Class Lounge has a separate entrance from the main Star Alliance Lounge but both lounges are connected in the back. First class passengers may travel back and forth between the two lounges and use the amenities of both lounges. The Star Alliance First Class Lounge is a smaller but more private space with a separate seating area, two private VIP rooms and a la carte dining services. The main seating area is not very large but has group seating for about 30 people or so and two private rooms for VIPs and celebrities. First class passengers enjoy a dining room with waiter service and a small buffet area with miscellaneous snacks, desserts and an upgraded alcohol station. The Star Alliance Lounge LAX is a massive space and features a large seating area with plenty of useable spaces to rest, relax and be productive. As you enter the lounge, there is a coat and luggage storage room to the right of the attendant desk. The storage room is unsecured but is monitored by the front desk agents. If you need to surf the internet but forgot your laptop or tablet at home, the Star Alliance Lounge LAX offers a free iPad loaner service. You can request one from the front desk to use during your stay. However, they will hold onto your passport just to make sure their iPad gets returned at the end of your visit. The lounge is smartly designed with a main seating area for relaxation and socialization and smaller, private rooms for additional peace and quiet. The main seating area offers a variety of comfortable seating options such as armchairs and couches to relax and socialize with your fellow passengers. Light curtains are used to divide the massive space and give the main seating defined spaces. Password-protected WiFi is provided throughout the lounge so you can work from anywhere but there is a dedicated work space located in the back of the lounge and an enclosed library room for increased privacy and productivity. Electrical outlets are located by all the main seating areas to keep your devices powered and wireless printing is available free of charge. If you want to just chill out and relax in front of the TV, there is a media room to catch up on the day’s news or zone out with some mindless programming. There are no day rooms to lay down so if you want to shut your eyes for a bit, this would be the place to do it. 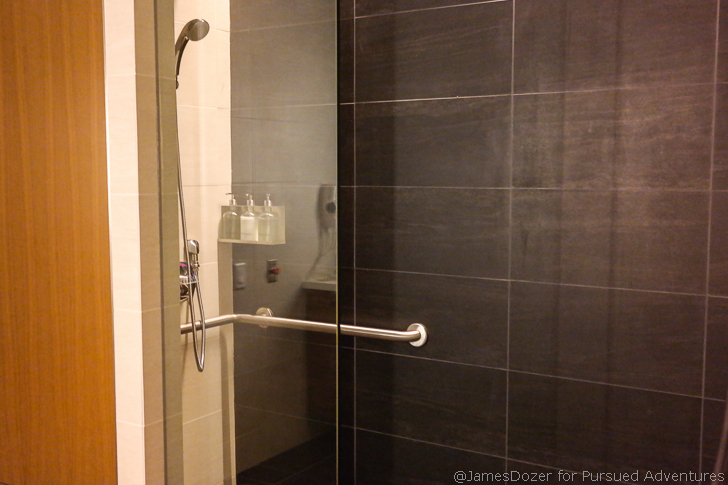 If you are connecting from another flight or just need to freshen up before your flight, shower suites are available on a first come, first served basis. The dining room is located in the center of the lounge with plenty of seating for individuals, couples and groups to share a meal together. The focal point of the dining room is the beautiful, “wine rack” wall featuring hundreds of wines bottles in an elegant glass case. The self-serve buffet station offers a great selection of hot and cold dishes from salads and wraps to local favorites such as Chicken Tikka Masala and a Pho noodle station. The dishes are fresh, locally sourced and wonderfully prepared. You won’t go hungry here. I found the food selection to be quite tasty. The Pho noodle bar is a nice touch and is very appropriate for the Los Angeles demographic. If you have never had Pho before or don’t know what it is, just think of it as a Vietnamese chicken noodle soup. You choose the type of noodle you want, add your chicken (or crab meat), vegetables, herbs, spices and broth and voila, the most fragrant chicken noodle soup you will ever have. And let’s not forget about dessert. For alcohol, there are several self-serve alcohol stations located throughout the lounge and a main bar located in the center of the lounge with bartender service. All drinks are provided free of charge. If the main seating area of the lounge is a little too claustrophobic for you, then take a seat on the indoor balcony and enjoy some “fresh air” and the people watching people below. The indoor balcony overlooks the international departure terminal and even has its own bar so you don’t have to walk too far for a drink. But my favorite part of the Star Alliance Lounge LAX, and the reason why it’s my favorite lounge in the entire Star Alliance network, is the impressive outdoor terrace. The entrance to the outdoor terrace is located in the way back of the lounge and you will mistake it for an emergency exit if you are not paying attention. Just walk back towards the shower suites and look for these potted plants. Especially in Los Angeles where you have over 300 days of sunshine, it’s great to have an outdoor space to get some post-security, fresh air and relax before your flight. The outdoor terrace is incredibly calming and relaxing with a tranquil waterfall feature, black rock fireplace and impressive views of the ramp and runway. If this wasn’t located airside of an airport, this outdoor terrace would make for a pretty hip Los Angeles night spot. And don’t worry about the smokers. It’s not allowed in the outdoor terrace. There is no doubt the Star Alliance Lounge LAX is one of the best business class lounges in the world. I have had the pleasure of visiting this lounge several times now and it still amazes me each and every time. The lounge is spacious and offers a variety of useable spaces for passengers to rest, relax or be productive before their flights and the outdoor terrace is a literal breath of fresh-air. Have you visited the Star Alliance Lounge LAX? If so, please share your thoughts with me in the comments section below.